A magazine for alumni and friends of Dartmouth Medical School and Dartmouth-Hitchcock Medical Center. It was New Year's Eve of 1999. Some donated organs were desperately needed for a transplant patient in Boston. And all other possible medical helicopters were spoken for. It was a tough dilemma that faced a DHMC administrator on that momentous night . . .
Divining the deepest secrets of the human brain is painstaking work. Two neuroscientists at Dartmouth have devoted their careers to probing neurons and synapses in an effort to better understand this most mysterious of organs. There is growing recognition of the importance of cross-cultural issues in medicine. No matter how well-intentioned a caregiver is, it's not possible to truly serve patients without understanding their cultural tenets. This point is illustrated by a medical student's perspective on two clinical rotations. Smallpox was eradicated worldwide in the 1970s, and the hope is that within a few years polio, too, will have been wiped from the face of the earth. A Dartmouth graduate who spent two months in Pakistan helping with that effort tells his story. The news this issue ranges from Russian libraries to a new Rhodes Scholar, from medical law to mitosis—and more. DMS Rhodes Scholar is heading off to Oxford's "towery city"
Development	(HTML) (pdf) 196 KB "Honoring 'triumph'"
"Norman Yanofsky, M.D. 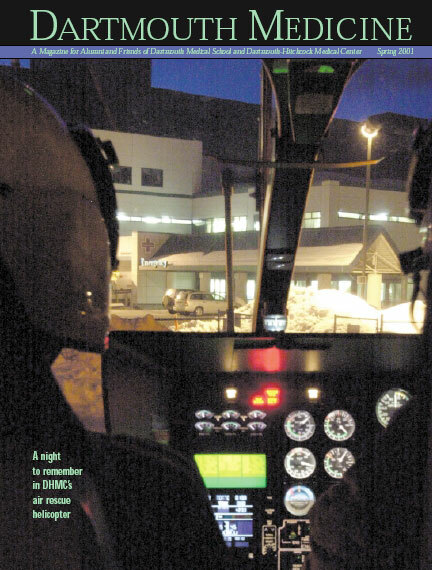 : Ready for any emergency"
"Katharine Phillips '87: Shedding light on BDD"
The cockpit of Dartmouth- Hitchcock Medical Center's air rescue helicopter is no stranger to drama. In fact, it's the "everyday" nature of a dramatic event that took place on New Year's Eve of the millennium that was most remarkable to the DHMC administrator who tells the tale. The cover photograph is by Jon Gilbert Fox. The associated feature starts on page 26. Dartmouth Medicine is published four times a year-in Fall (September), Winter (December), Spring (March), and Summer (June). It is produced using a Macintosh G4 and Quark XPress 4.11. We are happy to send Dartmouth Medicine-on a complimentary basis -to anyone who is interested in the subjects that are covered in the magazine. Write us if you'd like to be added to our rolls. We regret, however, that the complimentary subscription offer can be extended only to addresses within North America. Because our mailing list comes from eight separate databases, some readers may receive duplicate copies. Please share extra copies with someone else, or send us the address panels from all the copies you receive, and we will be glad to eliminate the duplication.